This morning while I was still cuddling in my cocoon, hiding from the cold, I was pulled from my semi dream-state into the reality of a new day by the sound of our three spaniels charging past our window in pursuit of some or other perceived threat. Their ferocious barking did not worry me as I suspected the danger to be nothing more than our neighbour's dare-devil cat taking its early morning walk along the top of the wall. It made me smile. The three of them are always ready for an adventure of some sort. Listening to their excited barking, I realized once again how privileged we as humans are to have pets in our lives. However, it is something we most often take for granted. They fill our lives with their presence, and give us enjoyment with their antics. No two pets, whether they be dogs, cats, birds or hamsters are exactly the same. Each one has its very own unique personality. 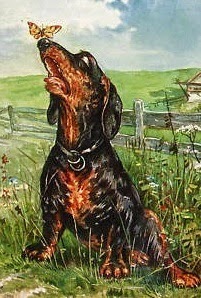 Until recently we also had, apart from our three spaniels and our little Jack Russell, an adorable Dachshund, Mr Patch. He was the old man of the family, a real gentleman in his built-in tuxedo. He loved taking strolls through the neigbourhood, inspecting the delicious smells emanating from the hood's choicest rubbish bins. Often, much to my dismay, he would drag one of the other puppies along on his strolls. Much later they would return, Mr. Patch, still dapper and clean, followed by a very bedraggled, dirty and quilty-looking pup. He was constantly grooming Monty, our male spaniel, and it was his solemn vow to make sure he inspected all stationary objects in our yard (and if I was not diligent enough, in the house too) and give it his personal mark of approval! We have so much to learn from our pets, especially dogs. They are the most loyal friends we have. No matter how we treat them, they forgive instantly and love us unconditionally. They give us all their love, adoration and attention and are grateful for every morsel of attention they get from us. They never turn from us in a huff, nor swear never to talk to us again because of some or other suffered insult. They wait patiently for us to return, they wait patiently for us to feed them, play with them, go to bed and wake up. They are always hopeful and despite many disappointments, they stay eternally optimistic. They guard us with their lives, they share their beds with us and even their fleas. They are in touch with our moods, and don't mind staying right by our sides all day long while we are sick in bed, not even my husband can do that!! They are great conversation starters, and after sharing doggy stories, complete strangers part from each other feeling as if they have found a long lost friend. Pets come into our houses, sometimes after long and careful consideration, sometimes unexpected, with soft baby eyes, a little wobbly and full of bashful mischief. Before long they run all over our hearts. Long after their departure from our lives you can still find the imprints of their paws on our hearts. How mistaken we are when we think that our pets need us, it is we who need them, for a home, however beautiful and immaculate, without a pet, is merely a house. If you flutter by here and have a story of a special pet you want to share with us we would love to read it. Please free feel to comment.